Calculation of gas outflow from the pipe or through the valve. 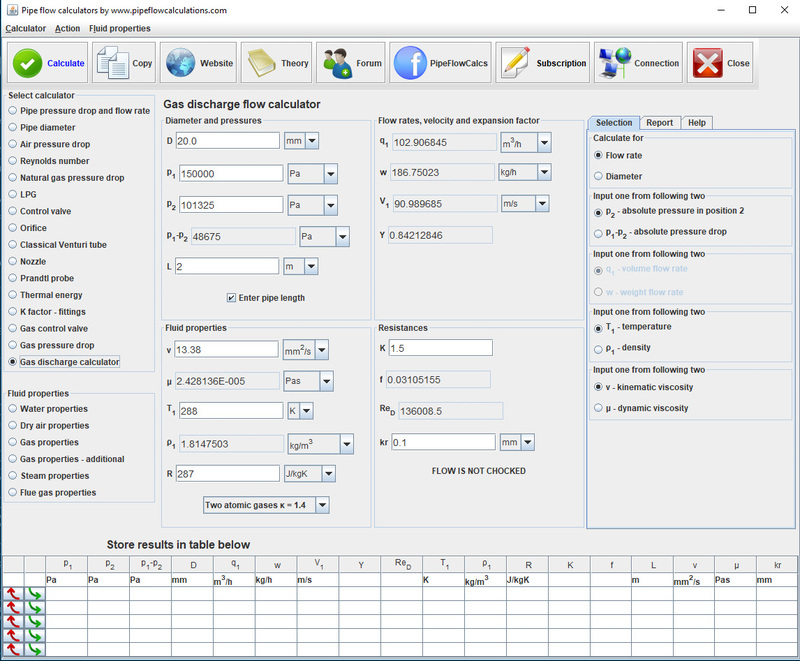 You can use the calculator for flow rate or pipe diameter calculation when the gas is exiting from a pipe or a reservoir to the atmosphere, or to some other pipe or a reservoir. You can use the calculator for flow in pipelines that include valves and fittings. You can calculate the maximum flow rate when you know pressure difference and pipe diameter, or you can calculate pipe diameter when you know flow rate and pressure drop. The calculator is applicable for all two and three atomic gases, like air, nitrogen, carbon dioxide and other gases. The calculator is suitable for steady flow with constant pressures at one point of streamline. What are the calculator restrictions? The calculator is suitable for ideal gases, as the calculator uses the equation of state for ideal gas during calculation. The calculator is not applicable for non-steady, pulsating flow. How is the calculation executed? Based on the known pressure difference (head loss) between one point of flow stream at the start of a pipe or in front of a valve, to the outside point (like atmosphere), or after a valve with known inside pipe diameter, mass flow rate, and volume flow rate is calculated. The calculator uses a modified Darcy formula for flow rate calculation. The calculator presents Reynolds number and expansion factor as calculation results. The calculator is checking if a flow is choked or not and presents choked flow status. For choked flow conditions, the calculator is calculating the flow rate for that condition. What else has to be known to perform the calculation? You should enter resistance factor K for valves and fittings if they exist in the pipeline as well as pipeline surface roughness. When is this calculator not relevant? The calculator is not relevant for liquids.